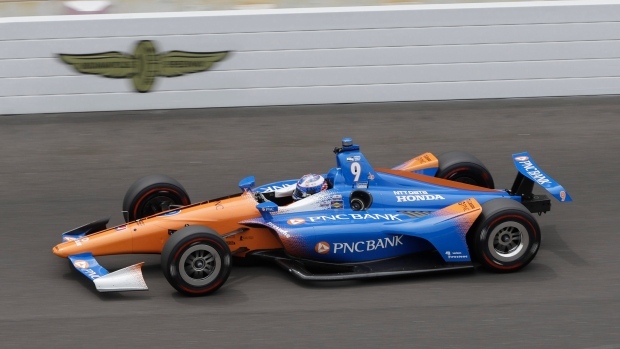 INDIANAPOLIS — Scott Dixon beat James Hinchcliffe in the finals of the pit stop challenge on Friday, dealing the Canadian driver and his crew another disappointment on Carb Day at Indianapolis Motor Speedway. Dixon had the advantageous inside lane, where concrete provides better traction, for the first and last run in the best two-of-three finals. Hinchcliffe won on his turn from that lane. It was Dixon's third victory in the pit stop competition for Chip Ganassi Racing, the only time anyone other than Team Penske has been victorious since the 2004 event. Hinchcliffe was trying to salvage something out of his heartbreaking week. He was bumped from the field in qualifying and will watch the 102nd running of the Indy 500 from the sideline.